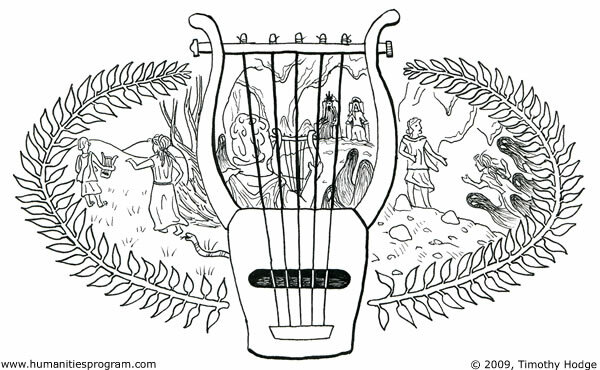 Orpheus was the son of Calliope, the goddess of epic poetry, and he was the greatest musician who ever lived. 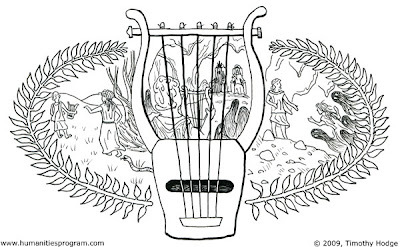 When he played on his lyre, all the people fell silent, animals gathered round to listen, and even trees would lean towards the sound of his music. Now Orpheus fell in love with a woman named Eurydice, and they were married with great rejoicing. But there was an evil omen at the wedding: the marriage torch could not be lit, no matter what Orpheus did. And this omen was immediately fulfilled. As Orpheus and Eurydice walked away from the ceremony together, a snake rose up out of the grass and bit her, and she died in his arms without a word. Heartbroken, Orpheus swore to get Eurydice back, no matter the cost. So he begged advice from many gods, and he searched through many strange lands, and he descended into deep caverns, until at last he found the entrance to the Underworld, the land of the dead. The gate to the Underworld was guarded by Cerberus, a snarling three-headed dog; but when Orpheus played a lullaby, Cerberus lay down to sleep. Then he came to the river Styx, which was guarded by the ferryman, Charon, who was not supposed to let anyone but the dead pass -- and they could only pass one way. Orpheus sang a beautiful song to Charon about his love for Eurydice, and the ferryman agreed to take him across, even though he was not dead. So Orpheus came into the cold hall of Hades and Persephone, the King and Queen of the dead. There before their shadowy thrones he played a song so lovely that all the dead gathered to listen. The souls of the good, who lived happily in the Elysian Fields, were filled with sorrow for his loss. The souls of the evil, who were continually punished for their crimes, forgot their pain in his beautiful music. Even the Furies, the three terrible goddesses who avenged crimes without mercy, wept in pity. And Hades himself was moved. "Ask me for a favor," he said, "and I will grant it." "Let Eurydice return to life," said Orpheus. Hades replied, "I will. But you must walk back to the living world with Eurydice following behind you, and you cannot look back until you have reached the sunlight, or she will be lost forever." Orpheus agreed. It seemed like an easy thing to do. But as he climbed the road out of the Underworld, he could not hear Eurydice's footsteps, and he began to doubt that she was following him. Perhaps she had gotten lost along the way. Perhaps Hades had tricked him, and never given her back in the first place. At last, just as Orpheus saw the daylight ahead, he could bear it no longer and looked back over his shoulder. But he had broken his promise, and so what he saw was Eurydice being dragged back into the shadows. She only had time to call out, "Farewell!" and then she was gone. So Orpheus lost his wife for a second time. And though he wandered the whole world lamenting her, he never saw her again--until he died, and went down to the Underworld one last time.